PA chairman tells Japanese newspaper he's willing to meet Prime Minister Netanyahu under Trump's patronage. 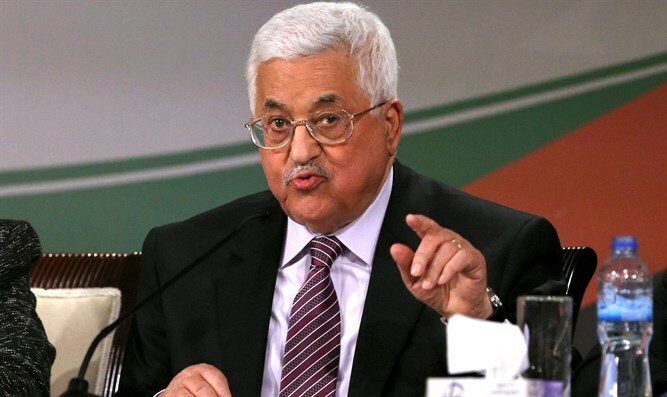 Palestinian Authority (PA) chairman Mahmoud Abbas said on Wednesday that he was willing to meet Prime Minister Binyamin Netanyahu in Washington. “I am ready to meet the prime minister of Israel any time in Washington under the patronage of President Trump. Will send our delegation to the U.S. to prepare for my visit there,” Abbas told the Japanese Asahi Shimbun newspaper in an interview. The interview was published shortly after the White House announced that Trump and Abbas would meet in Washington on May 3. “They will use the visit to reaffirm the commitment of both the United States and the Palestinian leadership to pursuing and ultimately concluding a conflict-ending settlement between the Palestinians and Israel,” White House spokesman Sean Spicer told reporters on Wednesday. The meeting between Abbas and Trump was first discussed during a telephone conversation they held last month. Following that conversation, Abbas praised Trump and said he brings “hope” for peace, even though PA officials had previously criticized Trump for his failure to stop Israeli construction in Judea and Samaria. “We are glad that now the U.S. administration listens about us from us, and not from third parties. President Trump knows that we are committed to a Middle East that lives in peace, justice and dignity, based on a two-state solution, international legitimacy and [the] Arab peace initiative. And he knows that we are partners in combating terrorism in our region and worldwide,” Abbas told the Japanese newspaper on Wednesday. Abbas has in the past rejected calls by Netanyahu to sit down for direct negotiations, choosing instead to impose preconditions on such talks.